It’s criminal… I’ve had a book dedicated to me! Echoes of Doubt, by Pat McDonald. #crime #police #fiction – The Diesel-Electric Elephant Company. …and it’s all about violent murder, drugs and the trafficking of humans. Author Pat McDonald knows me well! I am stunned (and I frequently have been, since the invention of the Taser), stunned, surprised and honoured to have had Pat’s latest novel (the latest of seven such) dedicated to me! Many people look at me and think “murder” and “violence” and “witless protection scheme” but I’m more usually the accused rather than an inspirational by-stander. The cover artwork is, you will surely agree, fantastic. Makes a chap want to rush out and buy it, eh? Well, you ought to. Pat has a distinct way with plotting, the action in all of her books follows quite naturally in a comfortable progression. The style is free and easy and a feather-pillow comfort to the eyes and the mind while reading. and sales will be rolling out to all sorts of “other” Amazon locations and to bookshops both reputable and disreputable. My copy is en route, and a full review will follow just as soon as I’ve spent a couple of evenings snuggled up in my cabin on the Cardinal, sipping brandy-fortified cocoa and reading it again (and again). In celebration, I thought that I would re-visit Mablethorpe, the little seaside resort so instrumental in the inspiration of this book. Not in person, of course – I am on the opposite side of the country at the moment – but photographically. It is a town that has many, many moods – a bit like Pat’s protagonists. Doggy, thou shalt not. Shalt not what? Shalt not anything, by the looks of things, although if you spot the two tiny flecks here (man centre and dog slightly to the right of frame), resistance and revolution are afoot. I do like seaside towns but I confess that I like them best out of season when everyone has the brim of their hat pulled down low, the collar of their long coat turned up high and even the dogs are scurrying from shadow to shadow, avoiding the jaundiced yellow puddles cast by the street-lights. Perhaps you might arrange to read your copy while trapped by the weather in some pink-wallpapered, saggy-bedded hotel or guest house room? A fried breakfast microwaved with tender, loving care by some moustachioed landlady, a lunchtime pint in a grubby, unwashed glass in an equally grubby half-open bar, and then perhaps fish and chips served in yesterday’s newspaper and last week’s grease as you amble back to the B&B to finish the last couple of chapters? Night falls swiftly at this time of year, and you really wouldn’t want to be caught out and about after dark, would you? 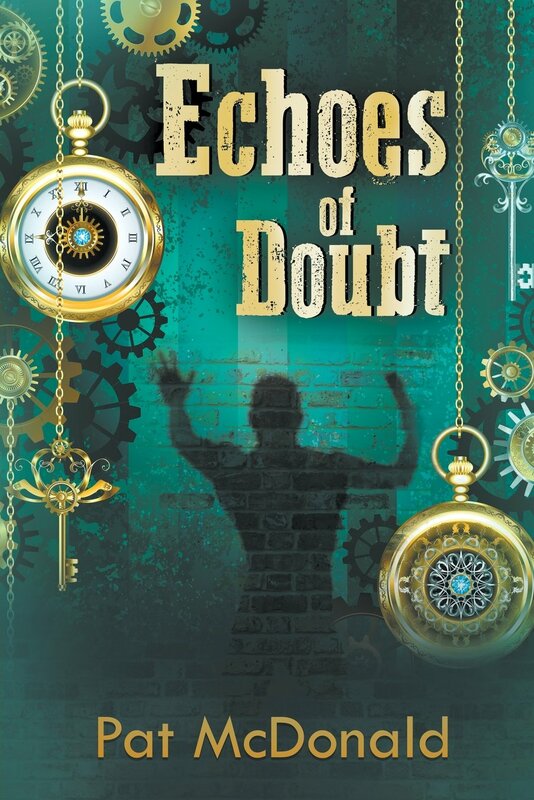 Echoes of Doubt, by Pat McDonald. I often move people to violence, although usually not literary. Wow! What can I say? What a fantastic introduction and by these pictures you would think you had already read the book! The solitary bench is so significant; the lone dog walker on the beach, the sand dunes and the forsaken seaside shops……..it makes me want to write it all over again. I wonder if anyone has written about a serial killer narrowboat captain? Plenty of material in your chronicles for research background….